Smart LED bulbs are the easiest and most popular devices to add to your smart home. It's been a long time since we first reviewed a group of "smart" bulbs. In that review, we covered five of the first generation of connected LED light bulbs. All five had one thing in common - they all relied on a hub to connect to the internet and to a companion cloud service. Fast forward about two years and the next generation of smart bulbs has appeared on the market. These bulbs no longer require a hub, instead connecting directly to your Wi-Fi network. I first reviewed a Wi-Fi connected Smart Bulb, the TP-Link LB120, in September. The LB120 is a white bulb with a tunable range from 2700K-6500K. This review will focus on three Wi-Fi Color smart bulbs shown above: The LOFTEK-SANSI (l), the third generation LIFX (c), and the TP-LINK LB130 (r). All three connect directly to your Wi-Fi network and provide both local and remote access to your lights. Each product has its own Android and iOS applications. Worthy of special note, the LIFX bulb also has a Windows 10 app. None of the products are Apple HomeKit compatible, but LIFX is planning HomeKit support early next year. 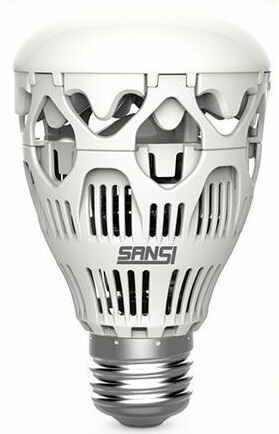 With a price of just $27.99, the LOFTEK-SANSI bulb is the least expensive of the three products in this review. The product name shown on Amazon is a long, but apt description of the product: "LOFTEK-SANSI 10W RGBW light Bulbs, Wi-Fi Smart Led Bulbs, 800 lumen dimmable colorful party lighting with APP control function" We'll see how the bulb fulfills its "party lighting" function when we dive down into some of the features. Setup is done using the Stellar Wi-FI app found in the Apple App Store (iPhone only) or the Android Stellar Wi-Fi app in the Google Play Store. You can also scan the QR codes below. Apple (l); Android (r). The LOFTEK-SANSI bulb comes with a folded color quick start guide with instructions for both iOS and Android installations. You can also view help here. Of the three products, this was the most difficult one to set up - mostly because there wasn't a wizard. You had to manually perform each step in the quick start guide in order to set it up. For example, you have to manually change your Wi-Fi connection to the bulb's Wi-Fi network (SLRGB********), discover the bulb, and then click on a setup icon to change the network to your home network. To join a Wi-Fi network, you need to type in the network name - the setup app doesn't provide you with a list of available networks. To set up remote control, you have to go to a separate Remote Control menu and create an account. None of these steps are difficult, but other products walk you through the setup process with wizards that virtually eliminate the need to refer to a quick start guide or an online manual. The composite image below shows the landing page (l) and the bulb control page (r). With Global control selected, you can control all of your LOFTEK-SANSI bulbs. The On/Off switch is in the upper right corner. Selecting an individual bulb takes you to the bulb control page. The bulb control page also has an on/off switch in the upper right-hand corner. The red, green, blue and yellow dots surrounding are presets that change the color of the bulb to the selected color with just a tap. The dimmer control is below the color circle. Across the bottom of the screen are additional options for Music, Scene, and Config. You can change the color of the bulb by merely touching on the small circle inside of the large color circle and drag it to the color you desire. As shown in the left image below, RGB values are shown for the currently selected color. The right image shows you the exact percentage of dimming selected. If you tap the music icon at the bottom of the bulb control page, you can select music from the local library stored on your mobile device. You can search by Artists, Albums, Songs, Genres, Composers, Compilations or Playlists. Once selected, hit the play icon, and the LOFTEK-SANSI bulb's colors and brightness will change with the music. The on-screen animation also pulsates with the music. When you tap the Scene icon at the bottom of the screen, you are presented with a scrollable list of 20 choices. There are choices for transitions between single colors and off, or combinations of colors. In addition, there are choices for blinking individual colors. The list is fixed, and you can't add your own choices. Across the bottom of the screen is a slider that allows you to control the speed of transitions/blinks. The slowest cycle, including on and off times measured 25 seconds. The shortest cycle measured ~ 0.5 seconds. The composite image below shows the Music and Scenes menus. The Config menu lets you change the name of the bulb, and lets you configure which Wi-Fi network to use. The LOFTEK-SANSI Wi-Fi Smart Bulb is a fairly simple device. It lacks support for the Amazon Alexa platform, though LOFTEK-SANSI plans to add Alexa to the new version of the light bulb coming out in 2017. It also lacks support for IFTTT and doesn't support any scheduling, so you won't be turning this light on/off using schedules. It does support remote access (tested). One nice feature, however, is that you can control your lights on the local network without an internet connection. If you want to remotely control the lights, you'll need to sign up for an account and have an internet connection. For a simple, inexpensive RGB Color, the LOFTEK-SANSI Smart Bulb is adequate, but if you want/need more features, the two products below offer more features, for, of course, more money.